More than 20 million Americans have already cast a ballot ahead of Election Day. A midterm election year that has voters already fired up might be getting turbocharged from early voting: In 18 states, according to the New York Times, voters have hit the polls early at higher rates than they did in 2014. In some states, the number of ballots already cast is nearing the total number of ballots cast in 2014, including on Election Day. As of Wednesday morning, at least 20 million people had already voted. Some of them might have voted more than a month ago: Early voting in Wisconsin began on September 20. It’s tricky to predict what this might mean for the final outcome. If there’s one thing to learn from the 2016 presidential election it’s that early turnout can be misleading (and polls can be wrong). But the figures we have so far suggest that interest in voting early in states with competitive Senate races has surged when compared to 2014, including Tennessee, Nevada, Arizona, and Texas, according to reporting from the New York Times and CNN. The surge in early voting this year reflects the growth of early voting nationwide. Thirty-seven states and the District of Columbia currently offer early voting without requiring an absentee excuse or justification. That, along with the process becoming easier in some states, has encouraged a lot more Americans to drive up to their local county commissioner’s office and cast a ballot. It’s also created a huge media storm around the surge in participation, and a thirst to draw early conclusions about the results of the races. Especially for a midterm election, voters tend to be more politically engaged and more ideological, Gronke added. Given the lack of presidential campaigning, Americans focus more on the issues at hand, follow the coverage of their state races and study the ballot initiatives more carefully. All of these factors correlate strongly with early voting, which is why we tend to see a higher number of voters hitting the polls weeks, or even months, before a national election. The demographics have changed, too, over the years, as Tara Golshan pointed out in 2016. Before 2008, early voters tended to be “older, educated, wealthier, ideological and highly partisan,” and early voters who cast ballots by mail were especially likely to lean Republican. Black churches used Sunday services to push people to the polls in what they called ”souls to the polls” initiatives, Barry Burden, a political scientist with the University of Wisconsin Madison, recalls. Early voters might also show up for candidates who share their backgrounds, said Eugene Kontorovich, a law professor at George Mason University — which could prove important in a year of many potential historical firsts for women candidates and candidates of color. Early voting in general has been on a rapid rise for the last 25 years. Burden predicts this year’s elections are likely to see less early voting than in 2016, but will set a new midterm early voting record. Some of the states where voters are enthusiastically casting ballots early recently changed their rules to make early voting easier. Minnesota and Wisconsin both made it easier to vote early and are reporting a drastic increase in early voting this year. In Minnesota, more voters have voted early in 2018 than in 2016, even though midterm years traditionally have lower turnout overall. Voter mobilization has also been crucial in expanding early voting efforts, like Obama’s 2008 campaign first showed. 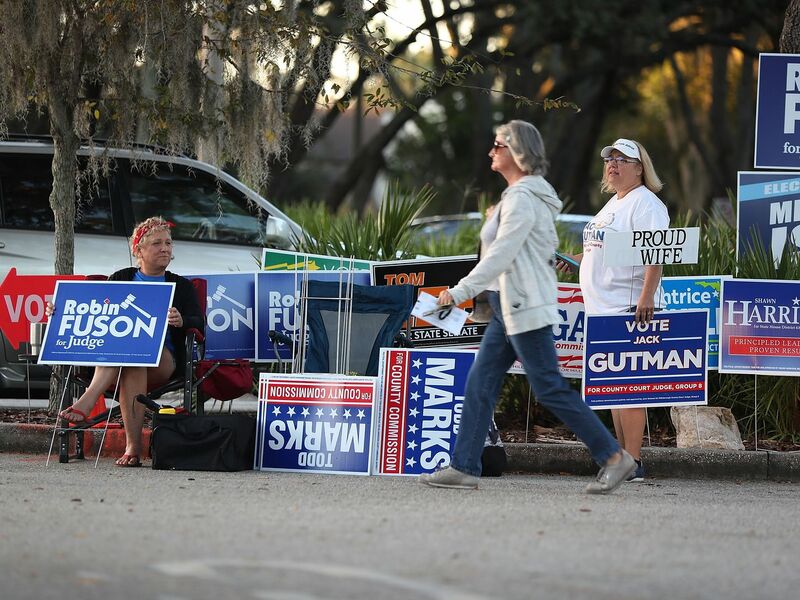 “Once you allow early voting, you encourage the parties to go after their core base and try to get them mobilized early and focus on ensuring turnout on them,” said Kontorovich. In-person early voting campaigns often target groups that vote together — churches, unions, informal political groups. Finally, while Burden says that a larger share of people vote early when the presidency is on the ballot, this year’s highly contested and competitive races are prompting eligible voters to hit the polls early. In Texas, where the Senate race has caught national attention, all counties saw a much larger first-day turnout than they did in the previous midterm elections in 2014, the Texas Tribune reports. In Georgia, where the number of ballots cast early this year is close to doubling the number in 2014, Stacey Abrams has engaged in a systematic “get out the early vote” effort in the governor race. Backers of both parties are showing signs of enthusiasm about voting this year, which has been evident in the higher turnout rates in primaries and special elections earlier this election season. “One concrete way for a voter to show their enthusiasm is to cast an early ballot,” Burden said. Early voting doesn’t necessarily predict election outcomes. Early voters aren’t necessarily identical to Election Day voters. Republicans are historically more inclined to vote absentee, while Democrats show up in bigger numbers during early voting. Moderates tend to wait until Election Day to make up their minds, Kontorovich says. “The big question of early voting is, ‘does it increase a phenomenon or does it redistribute it in time,’” Kontorovich told me. 1. We don’t actually know how early voters voted; we just know what party they’re registered with, and there’s no guarantee that they voted for that party’s candidate, especially in states where voter reg is weird like Ohio. 2. We don’t know how independent early voters are voting. A 40–30% Democratic EV lead is meaningless if all the independents vote for Republicans. In 2016, early voting suggested Democratic strength and enthusiasm in Florida, North Carolina, and Nevada — but in the end, Hillary Clinton only carried Nevada. While early voting periods have ended in some states, and others never had them at all, many states keep the polls open this weekend and even Monday. Otherwise, here’s when the polls are open Tuesday for Election Day. If you missed your state’s early voting deadline and are worried you can’t make it to the polls Tuesday, find out if you can get time off to vote. Alabama does not have early voting, and voters need a state-approved excuse to vote absentee. Early and in-person absentee voting began October 22. Arizona’s early voting period ends November 2. Early voting and in-person absentee voting ends November 5. Early voting in California varies by county. Colorado now votes by mail, but voters can register and vote in person beginning October 22. Connecticut does not have early voting, and voters need a state-approved excuse to vote absentee. Delaware does not have early voting, and voters need a state-approved excuse to vote absentee. Early voting varies by county, October 15 through November 2, including Saturday, October 27. Early voting begins on September 27 and ends November 5. Exact dates and hours are determined locally. Early voting begins on October 10 at the local county election board office or polling location. Early voting starts on October 8 and is available through November 5. The last day to vote early is November 5 at noon. Kentucky does not have early voting. Absentee voters may vote early with a state-approved excuse. Early voting ended October 30. Voters can cast an absentee ballot in person starting when ballots are made available, 30 to 45 days ahead of the election, at the office of an election official until Thursday, November 1. You can find information about where and when to vote here. Early voting starts October 25 and is open until November 1. Early voting is available in Massachusetts from October 22 through November 2. Michigan does not have early voting and requires voters to have a state-approved excuse to vote absentee. Early voting in 2018 is from September 21 to November 5. Mississippi does not have early voting and requires voters to have a state-approved excuse to vote absentee. Missouri does not have early voting and requires voters to have a state-approved excuse to vote absentee. Early voting begins October 9. Early voting begins October 7 and ends November 5, and the deadline to return absentee ballots in person is November 6. Early voting ended November 2. New Hampshire does not have early voting. Absentee voters need a state-approved excuse. Early voting ends November 5. Early voting this year ends November 3. New York does not have early voting, and absentee voters must have a state-approved excuse. Absentee ballots are made available as of September 27 in 2018. Some precincts have early in-person voting beginning on October 22 — you can find dates and locations here. Early in-person voting begins on October 10. Early voting this year is November 1 to 3. Oregon is a vote-by-mail state. Ballots were mailed out this year starting October 17. Voters can find when and where to drop off their ballots here. Pennsylvania does not have early voting, and absentee voters need a state-approved excuse. Rhode Island does not have early voting, and absentee voters need a state-approved excuse. South Carolina does not have early voting, and absentee voters need a state-approved excuse. Early voting starts September 21 this year. Early voting this year ends November 5. Early voting this year ended November 2. Early voting begins 14 days before the election and ends the Friday before — in 2018, that’s October 23 to November 2. Election officials can extend early voting to the day before the election. Early voting starts 45 days before the election; this year, that’s September 21. Virginia does not have early voting. Absentee voters need a state-approved excuse. Washington is a mail-in voting state and begins accepting ballots 18 days before the election, or this year, October 19. October 24 to November 3. Voters can vote via in-person absentee ballot in the county clerk’s office beginning 40 days before an election, or, this year, as of September 21.